Boys. They are bound to be the death of me. Especially one with blue eyes, perfectly Mormon cut hair, and probably the inspiration for the girl’s camp song "Hot Priest". Why the heck did he have to be the bishop’s son? Cause here’s the thing. While I’m Mormon, I don’t really belong. I mean, I want to, but I just can’t seem to keep on the straight and narrow. Seriously, look at me. I’m not even supposed to use the name Mormon anymore, but Latter-Day Saint is a mouthful. So I’m sticking to Mormon. Sorry, Prophet. The bishop knows my past. He knows my problems. There is no freaking way he’s going to let me date his son. Yet, Nate comes after me anyway. And I fall hard. But eventually….I will have to tell him about my past. And I know, he’ll run far, far away from me when I do. 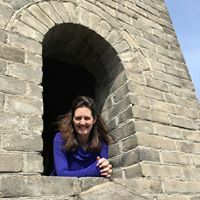 Author Kimberly Loth Kimberly Loth has lived all over the world. From the isolated woods of the Ozarks to exotic city of Cairo. Currently, she resides in Tucson, Arizona with her family including an old grumpy cat named Max. She’s been writing for ten years and is the author of the Amazon bestselling series The Dragon Kings. In her free time, she volunteers at church, reads, and travels as often as possible. Open only to those who can legally enter, receive and use an Amazon.com Gift Code or Paypal Cash. Winning Entry will be verified prior to prize being awarded. No purchase necessary. You must be 18 or older to enter or have your parent enter for you. The winner will be chosen by rafflecopter and announced here as well as emailed and will have 48 hours to respond or a new winner will be chosen. This giveaway is in no way associated with Facebook, Twitter, Rafflecopter or any other entity unless otherwise specified. The number of eligible entries received determines the odds of winning.